BlackBerry is not out of the smartphone race just yet, however it is standing on thin ice. In fact, BlackBerry continues to see its share of the smartphone market fall to iOS and Android devices. However, in an attempt to keep the share of the market that it still has, BlackBerry has released its newest phone called the 9720. Believe it or not, this new BlackBerry is not even running its new 10 operating system. However, the people who are still using BlackBerry think this is a good thing. The BlackBerry 10 operating system is really having a hard time getting its foot in the door, mostly because people who are not using BlackBerry prefer iOS or Android. On top of that, the people who are still using BlackBerry prefer the older operating systems. The 9720 is running BlackBerry 7 OS. The launch of this phone comes just after BlackBerry formed a committee to talk about strategies on how it can stay relevant in an ever-changing marketplace. Until BlackBerry gets its 10 operating system off the ground, it will have to continue relying on the old 7 version. During the last fiscal quarter, BlackBerry only shipped out 6.8 million smartphones. This would not be too bad if it was not for the fact that only 2.7 million of those phones were running the 10 operating system. Very few people are upgrading to the 10 operating system, and the people who are do not seem too thrilled with it. The 9720 has a “refreshed” version of BlackBerry 7. 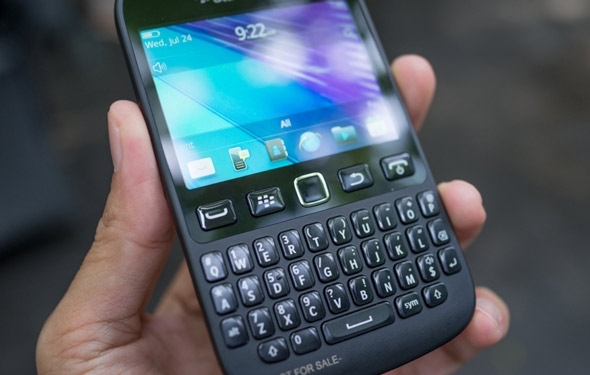 It also has a physical QWERTY keyboard, for which BlackBerry phones are known. The phone also sports a 2.8-inch touchscreen with a 480×360 pixel resolution. It comes with an FM radio and a 5-megapixel camera. Although these are nice features, none of them are really mind-blowing, which is the reason why BlackBerry is having such a hard time finding its own spot in the evolving smartphone market. Besides hardware, it seems as if BlackBerry is trying to rely on social networking features. For example, users will be able to post messages to friends on Twitter and Facebook simultaneously. This is great for people who are social networking crazy, but offers very little to those who are not. The phone also offers an updated interface. For example, users can swipe to unlock the phone. They can also use swipe gestures to open the camera or lock the phone. These are great features but nothing that is not already available on other smartphones. So when can you get your hands on the 9720? Well, not so fast. BlackBerry may not even release this new phone in North America. Instead, the retailer said that it will be released in Europe, Africa, Asia, Latin America and the Middle East. The company did not give a price or any kind of plans that suggest that it is coming stateside. The 9720 does not look like a bad phone; it just looks like BlackBerry is trying to rely on that same old song and dance. The 9720 is not groundbreaking, but it is trying to perfect things that have already been available on phones for a while. BlackBerry is going to have to come up with a new hook if it wants to keep what’s left of its dying user base. New Google Translate update on your Android, now with full conversation mode!